Crossed upper New York State through the Mohawk Valley. The eastern part of the drive is very scenic, across rolling hills and through towns too small to have more than one traffic light. Most have none. Around Carlisle/Sharon Springs, there were a number of old tourist cabins and motels, now abandoned; in other spots along the route, especially in Pennsylvania and Ohio, these places have been turned into VERY low-rent apartments instead of sitting completely idle. I also passed one silver-metallic tepee that still sells souvenirs, but it hadn't opened yet when I went by. 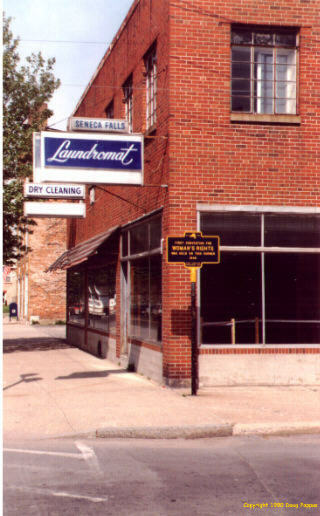 I doubled back a block or so to the National Women's Hall of Fame, down the street from the Women's Rights Laundromat in an old bank building. It's OK, but certainly could use a large donor or two to arrange for nicer quarters and pay for basic maintenance. The bulb on the slide projector was burned out, and in the most prominent display, in the center of the exhibit room, Ortho Pharmaceuticals (makers of birth-control pills) featured their own honorees. Waterloo, the next town, is the birthplace of Memorial Day: it organized a Civil War commemoration in 1866. Other cities have challenged this claim, but Waterloo's got a Congressional proclamation on its side. At about 11:30 a.m., some of the locals were already preparing for a chicken cookout on the town square, in front of the high school, as Waterloo celebrated its 125th Memorial Day. Found an excellent used-book store by the side of the road near Geneva, NY -- Calhoun's Books. Bought a 1968 Rand McNally Road Atlas and a 1977 "America By Car" guidebook for a quarter each; also Lowell Thomas's 1955 Guide to the NY Thruway for 75 cents, and, for $15, King's Handbook of the United States, a 900-page hardcover guide to American history, geography and tourist attractions published in 1891! The book claimed over 2,600 illustrations and 51 colored maps, and I wasn't one to doubt its contention. The frontispiece was inscribed, "Rosa from Papa, 1893" -- maybe a graduation present? Drove through Erie and out to near the tip of Presque Isle State Park, honoring Admiral Perry's victory on the Niagara in the War of 1812. Then tried to double back through Erie to find the reconstructed ship and the Anthony Wayne Monument, but got lost and couldn't find either; instead headed on into Ohio.